When Andrew Bruggeman learned he was going to be one of the officials at the 2018 USA Hockey All-American Prospects Game, the North Mankato, Minnesota, native was excited. But when he heard who the other official and two linesmen would be – Kevin Briganti, Sean McFarlane and Patrick Richardson – he got even more excited for a different reason. 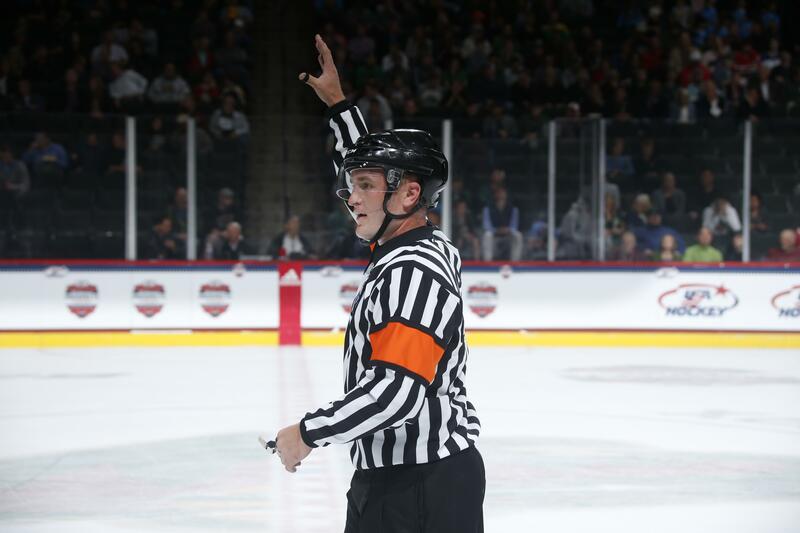 Each year, four officials out of USA Hockey’s Officiating Development Program are selected to work the All-American Prospects Game. For the officials, it’s a reward for the work they have done moving their way up the levels of hockey. Bruggeman started in the Officiating Development Program when he was in college at Minnesota State University Mankato. He had previously worked youth games, but saw the program as an opportunity to officiate at a higher level. Officials start out in leagues such as the North American Hockey League or the United States Hockey League. Eventually, most officials end up moving into higher levels. Once they graduate they often end up in professional minor leagues like the ECHL. Bruggeman started at the junior level and worked his way up. He eventually got to officiate Game 3 of the USHL’s Clark Cup Final between Tri-City and Dubuque at a sold-out arena in Kearney, Nebraska. As Bruggeman was starting his ascent in the officiating world, Patrick Richardson was well on his way as a linesman. He was selected to be a part of this year’s All-American Prospects Game officiating team as he enters his 16th season as USA Hockey registered official. Richardson came into the All-American Prospects Game with plenty of experience on big stages. Prior to taking some time off in the summer, Richardson had officiated Game 7 of the Kelly Cup Final in the ECHL. But for Richardson, getting asked to work the All-American Prospects Game was a memorable moment. For both Bruggeman and Richardson, this year’s game at Xcel Energy Center in St. Paul, Minnesota, was the first time they had ever worked a game on an NHL rink. Zelkin is aware of some of the challenges these officials may face and tries to give them advice before the game begins. Ten of those players who were showcasing their talent on the ice were playing in their home state. This was also the case for Bruggeman. It was his first time on the ice at Xcel Energy Center since he played in the 2008 Minnesota State High School League state tournament. When asked to describe this year’s group, Zelkin spoke about all of the officials’ willingness to give back. It’s something Richardson and Bruggeman say is important to all of the participants in the Officiating Development Program.